Miniloftmitte's downtown studio apartments are located in a stunning, prize winning building that combines a new building with renovation of an existing structure from the nineteenth century. The architects/designers are also the owners of the apartment, and have their own apartment in the building with their family. Architecture buffs love it here! The apartments allow you full independence while enjoying your stay in Berlin in a unique atmosphere. The generous floor plan allows you to indulge in the modern luxury of pure space. The apartments are equipped with everything you need, and we provide all-organic products and cleaning supplies. All major public transportation routes can be easily reached from this central location, and so many Berlin attractions are within walking distance (Brandenburg Gate, Reichstag, Alexanderplatz, Berlin Wall museum). There are supermarkets and excellent restaurants and cafes within five minutes walk. The Building - Phase 1: Britta Jürgens and Matthew Griffin, the architects who run the minilofts, also developed and designed the buildings. The miniloft building was built on the property Hessische Str. 5 in two phases from 2001 – 2004. It is a complex interweave of renovation and new construction. 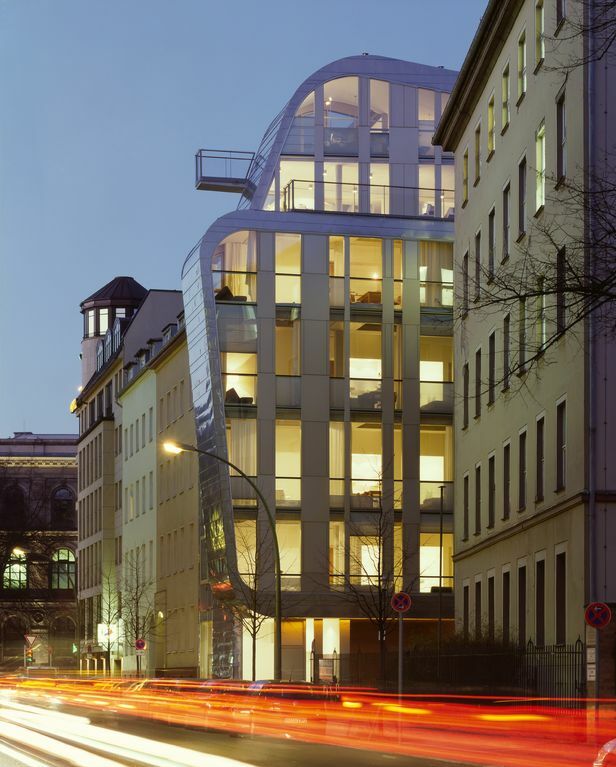 When they bought the property in 1999, the rear wing which now houses the classic minilofts was a run down building from the 1890's typical of Berlin Mitte. In the first phase the architects completely transformed the narrow original wing by renovating the existing apartments. The Building - Phase 2: In the second phase, the modern miniloft building (bender), was constructed in the overgrown bomb site at the front of the property. Its three bent stainless steel ribbons embrace the existing rear wing behind and navigate between the buildings on either side. The building has received several prizes, and been internationally published in many magazines and books. We built the Minilofts on a partially destroyed lot (from WWII), close to the former line of the Berlin Wall. After the wall fell, East Berlin was a thrilling place, full of opportunity and energy. And 20 years later, it still is! Only now there are plenty of shops, galleries and restaurants in the neighborhood. Underfloor heating in the New building. On request available: yoga mat, pilates ball, weights and a weight hula hoop. One-time fee 10 Euros. We provide everything you need, including coffee, tea, oil, vinegar, sugar etc. Cleaning products are also provided. Kitchenette with 2-ring electric hob, sink, fridge and microwave. Also a cupboard with toaster, kettle and coffee-making things. You can borrow our DVD player and there's one of Berlin's best video stores around the corner - feel free to use our account. The miniloft is non smoking, and equipped with modern amenities including highspeed wireless internet connection for your laptop, cable TV, telephone, kitchenette, bathroom, queen-sized bed, couch and dining area, and an on site self-serve laundry. Excellent location with access via public transit, comfortable, and spacious feeling with the high ceilings. Very close to transportation, able to easily walk to sites. Wall Memorial Park just down the street. Accommodation and staff great. Would stay there again. We had a great stay at the miniiloft. Checking in and out was simple and communication with the managers (on site) was good. We were a little disappointed to get an apartment in the”old building” because there was no elevator and no AC. Definitely not as fancy as in the pictures on the website. We later learn from friends that most apartments in the city have no AC. This summer was particularly hot. The old building apartments don’t get direct sunlight and therefore the inside temperature was manageable and 2 small fans were provided. We could have used a larger fan. The apartment was spacious enough for us 3, clean and with a spacious functional bathroom. You can request a mat for the shower floor: do so it’s really slippery and you can easily have an accident.The mini kitchen was enough for fixing breakfast. The building has a washer and dryer downstairs which is not very practical when you have 3 floors of stairs to carry laundry around, so we skipped laundry while in Berlin. The location is perfect for visiting the city with easy access to public transportation, restaurants and grocery stores nearby. Because of the extreme hot we ended using Uber a lot. The Miniloft is a very good location at a fair price to stay in Berlin for few days. A very central location close to public transport and sights. The apartment itself was thoughtfully designed and well-fitted out. The staff are delightful - very helpful and speak wonderful English. All our needs were catered for. Definitely recommended as a place to stay. Modern and unique loft with enough room for four, clean and friendly, easy communication. Great location with nice restaurants, bars, supermarkets nearby. We walked to all major attractions but there are a lot of different kind of public transport nearby. We lived our stay. Excellent location in Berlin and excellent loft! We had a wonderful time in Berlin thanks to our stay at the Miniloft. Andy and Estefania were wonderfully helpful. The loft was clean and had a great view of the street. There was no noise. The weather did not cooperate though, but Berlin has so many other points of interest that even with the wind storm we had things to do. Thanks again to the folks at Miniloft for giving us a wonderful experience in Berlin. Miniloftmitte is located in the Heart of Berlin's historic center, in the popular gallery district. Main points of interest such as the Brandenburg Gate and the Parliament Buildings are only 15 minutes walk away. The famous 'Scheunenviertel' culture and night life scene is just around the corner, as are many art galleries and museums. The nearest subway station (Naturkundemuseum) is a three minute's walk, and there are four stations within a 10 minute walk. Other Activities: Shopping, galleries, museums, restaurants, nightlife... the best of Berlin. Please contact us if you have any specific needs. Children under 2 years of age are free! We also provide all that you need for your baby/toddler, just ask us. We accept pets but there is a 20 euro extra charge for extra cleaning.